This salve is a unique blend of sage and patchouli essential oils. 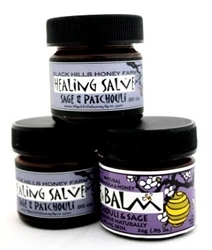 Patchouli is one of the best essential oils for rough, cracked, loose sagging skin. Great for wrinkles. The proplis and aloe are added to help treat skin disorders, aids in wound healing and tissue regeneration. Honey is antibacterial and is a good all-purpose skin conditioner.